These 2 pigs, Herefords, have outgrown the mobile pens. So now they are mobile themselves. There is one thin wire that carries electric that they avoid. I avoid it too. The other day the dog decided to crawl under the electric wire and realized half way through what a bad idea it was. 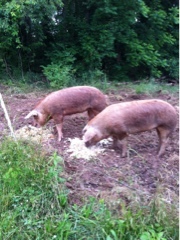 These two start the day with some leftovers from local food sources and then get to work clearing the area. This patch is still quite weedy and more overgrown than we want and pigs enjoy all they dig up. Looking forward to grass not poison ivy on those last paddocks.